CenterPoint Energy offers the SCORE and CitySmart Programs to help customers address energy costs through energy efficiency. 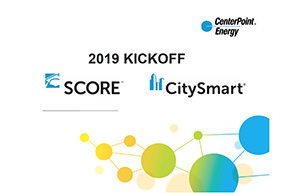 The SCORE and CitySmart Programs provide complimentary tools, services and incentives to participating customers who complete projects resulting in peak electric demand and energy savings. Common new construction and retrofit projects include the installation of efficient lighting technologies, ENERGY STAR® qualified roofing material, high efficiency motors, and high efficiency air conditioning equipment. SCORE Market Transformation Program: A program that promotes energy efficiency upgrades at K-12 public schools, private schools, higher education, places of worship, and non-profits through incentives and services. Services include energy performance benchmarking, energy master planning workshops, technical assistance, and communications support. Click on the SCORE section above for more information. CitySmart Market Transformation Program: A program that promotes energy efficiency upgrades at municipal, county and select state agencies through incentives and services. Services include energy performance benchmarking, energy master planning workshops, technical assistance, and communications support. Click on the CitySmart section above for more information. SCORE Lite Market Transformation Program: A program that promotes energy efficiency upgrades at any institutional facility (i.e. all eligible SCORE and CitySmart participants) through incentives but does not include the other services offered in the SCORE or CitySmart Program. Click on the SCORE Lite section above for more information.